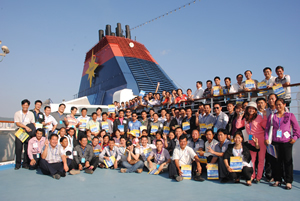 Star Cruises today warmly welcomed 100 Chinese ethnic minority citizens from the impoverished villages of Yucai Town, Hainan to enjoy a day of festive cruise fun and celebratory dinner onboard SuperStar Aquarius. Star Cruises is delighted to introduce the villagers, who are descendents of Li and Miao tribes in Yucai Town, to SuperStar Aquarius which started her seasonal deployment in Sanya in November 2011. For many of them, their first visit to an international cruise ship was an eye-opening experience. They jubilantly checked out the Chinese and buffet restaurants, and recreational facilities such as cinemas, spa, open-deck swimming pool and gift shop. Star Cruises wrapped up their visit in a sumptuous buffet dinner. They went home with Star Cruises souvenirs and fond memories of the crew’s warm hospitality.